Why in the world would someone even need to make Thanksgiving in an hour? I don’t really know. Maybe at the last minute you decided you don’t really hate your family? In any case, if Rachel Ray thinks you need to make Thanksgiving in an hour, then who am I to argue? And before you protest that there is no stuffing, the Chickpea Cutlets do taste a bit like stuffing, especially if you add extra sage, so I think it’s ok. Of course, you can always skip the mashed potatoes and make stuffing instead. I accomplished all of this well within an hour, so I think most people will be able to as well. Of course, if your kitchen is a disorganized mess and if you don’t have all the right pots and pans, don’t expect magic to happen. But with a reasonably well organized and stocked kitchen you should be good to go! Let’s count backwards, shall we? Place cranberries in a sauce pot, add 3/4 cup of water, cover and bring to a boil. Gather all of your ingredients and equipment, down to the measuring cups and spoons. Put potatoes in another pot and bring to a boil. Prep everything for the gravy. Get the onions going while you prep the mushrooms and other ingredients. Preheat oven for broccoli. Remove cranberry sauce from heat and add the agave. Put sauce in a bowl and place in the freezer. Stir every few minutes to get it to cool as fast as possible. Prep broccoli and get it in the oven. Cook chickpea cutlets. You should use 2 pans here so that it’s fastest. At this point you’ve got about 20 minutes left. In that time you need to stir the gravy, drain the potatoes, stir the cranberry sauce and remember to flip the cutlets and broccoli. But essentially all your hard work is done and all you have to do is not forget about any of the dishes you’re making. You should even have some time to get some dishes done! Remove broccoli from the oven, transfer to a platter. Place gravy in a server. (Don’t forget to stir the cranberry sauce!) Mash the potatoes. Transfer cutlets to a serving plate. Transfer cranberry sauce to a serving bowl. Serve everything! Happy Vegan Thanksgiving! Someone once told me the chickpea cutlets taste like stuffing, but they meant it in a bad way. And I pretty much resolved right then and there, that I would never cook for them again. This makes sense. Really, the most important component of tgiving is gravy. Rachel Ray’s got nothing on you! I still haven’t made the chickpea cutlets, I’m going to make this entire meal in an hour as soon as possible! I want to do this. and now having no time is no excuse. This is fantastic! Great guide for a new vegan or someone who wants to keep it simple. Thanks for putting this together! Katie don’t give up on the chickpea cutlets -they are a fave in our house. Give them another shot!!! I’m out of breath just reading the post! Ooh, dag, would you lookit that gravy? I’ve got all the time in the world, but I loooove the plan. I love plans in general actually. Had chickpea cutlets, potatoes and gravy , and broccoli with cheezy sauce for dinner last night. Not quite Thanksgiving (need cranberry sauce next time). Don’t wait until T-day for this meal, it is so good. And Isa is right- double the cutlets, and it will go even faster the next time. Your chickpea cutlets are so easy to make and yummy too! I’m digging the Thanksgiving in a hour! I will need to make a vegan Thanksgiving along side my mother’s “traditional” one, so this will be perfect. Call me lazy, but I don’t want to be tripping over a turkey all day. I love how you just make things so simple, yet they come out so well. The chickpea cutlet is the number one most used recipe in my house, although the coconut lemon bundt cake is a close 2nd. With these recipes, every day could be thanksgiving. I’ll be going with this over the Tofurkey pre packaged meal.. thank you!! thaks giving day, i am looking forward it! Never realized the cutlets tasted like stuffing, hmmm. They remind me of schnitzel and they are delicious! Who needs pre-packaged, chemical laden crap, when you can make this in no time at all??? This was amazing. I made it last night took me longer then an hour though. Great tip from the recipe to let the cutlets sit a minute, it gives them a more meatier texture. Thank God. I work in retail and don’t have ANY time during the holidays. This post has changed my mind from, “I’ll just have some Diet Dr. Pepper and some bean dip while everyone is eating dinner” to “Everyone else is going to be so freaking disappointed that they don’t get to eat my delicious vegan version of Thanksgiving”. Thanks! That was great! I am not especially fast in the kitchen, but the first set of cutlets were finished at 1:05, so this really can be done in an hour! Tastes great too. Thanks for writing this up, Isa! I honestly don’t care about the holidays, but decided to make this on Thanksgiving because I had the day off and wanted to see if I really could do a multi-dish meal in an hour. Guess so! Though, I have to say – the broccoli should have been at least tripled. I finished it off before I even sat down to eat. That stuff is addictive! I did not plan ahead for what I’d eat on Thanksgiving, having a big school paper due at 9pm on Wednesday, I just thought I’d eat whatever was vegetarian at Mom’s, which is never very much. But, having seen this plan for Thanksgiving in an Hour a few days earlier, I decided on Thanksgiving morning that I would try it, so I brought every ingredient I needed from home, stopped on the way for whatever else I needed, and went to Mom’s. It took me more like 2 hours because the kitchen was busy with people running around in it, but the plan totally worked and I had a delicious vegan dinner on thanksgiving after all. Thanks so much for the Thanksgiving in an Hour post, it made may T-day very much more fun and delicious… and now I have a delicious homemade dinner (that will yield a week’s worth of leftovers!) that I know I can make in an hour any day. Score! This was our first (Canadian) Thanksgiving as a vegetarian (might end up vegan but we’re working our way there) and my 12-yr-old helped me make this meal in an hour (I did some prepping beforehand, knowing we’d be slower with her ‘helping’) and it was a huge success. Thank you so much. I wasn’t sure how we were going to handle the holidays and now we know we can and in a way that’s not so different from our usual celebration. My comment meant to read “first Thanksgiving as a vegetarian family” (my daughter and I are lacto-ovo vegetarian while my husband still eats meat at lunch sometimes and when we’re out). WIll be celebrating Thanksgiving every other week from now on. This meal is way too good to only enjoy it once a year. Hi Isa, always thought that a holiday meal in an hour isn’t about deciding one doesn’t hate one’s family. I was super happy to see this post in 2010 when I was in my third trimester and working FT–tired. And then I live in Belgium where the rest of my local family doesn’t care about Thanksgiving enough to motivate me to make an all-day cooking extravaganza on top of that. There is no day off to do it either. 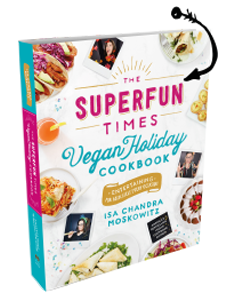 Finally cooking a holiday dinner can be intimidating, so I’m so glad that you presented a vegan way to Thanksgiving in an hour. Cheers. Mmm, this is a great menu planner! I am already thinking about making some of these great recipes. I was thinking about food all day, but fortunately I packed snacks to hold me over till dinner. I am having a problem with writing, but the website is working fine. 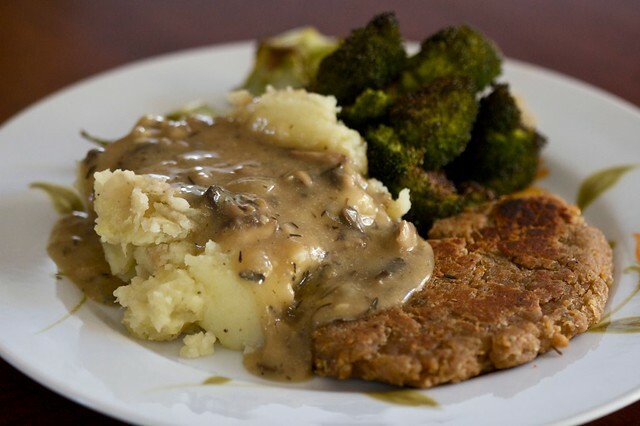 Loved the gravy but the cutlets were dry and not my favorite. I’d omit the paprika and increase savory spices. They tend to burn easily if on low heat. And sad to say they aren’t very healthy. Lots of oil, bread crumbs and wheat gluten. But I do love Isa’s other receipes!!! !